What does riding a bike have to do with women’s rights? 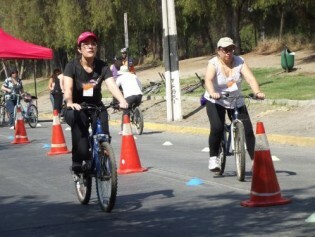 According to the Chilean feminist group Macleta, which promotes cycling and a gender perspective on public transport, a bicycle is a powerful tool for social change. "It's extremely serious, a full-blown environmental catastrophe," environmentalist Sara Larrain told IPS, describing the impact of the fire that has been raging through the Torres del Paine National Park in Chilean Patagonia since Dec. 27. In support of Chile's ongoing student protests, and voicing their own demands, thousands of people took to the streets in more than a dozen cities in Latin America Thursday demanding quality public education. As students and teachers continue their massive protests in the streets of Chile's cities, one of the most extreme methods of demanding higher-quality, free public education is the hunger strike being undertaken by 28 youngsters at secondary schools across the country, four of whom have not taken food for nearly 40 days. The problems plaguing Chile's education system are not unknown in the rest of Latin America, but are especially complex in this long, narrow country sandwiched between the Andes mountains and the Pacific ocean. Fear is growing among environmental and indigenous organisations in Chile over the possible appropriation of native seeds by foreign companies, opening the doors to transgenic crops and their negative impact on biodiversity. "Today we need structural changes; we need to move towards a new model of education in Chile and to sit down to talks that include all of the concerned parties," said Camila Vallejo, one of the leaders of the student movement that has the right-wing government of Sebastián Piñera up against the wall. "What is happening in Chile isn't justice; it's a pantomime, because under the anti-terrorism law, there is absolutely no way justice can be done," José Venturelli, spokesman for the European Secretariat of the Ethics Commission against Torture, said on a recent visit to this South American country. The HidroAysén hydroelectric project in Chile’s Patagonia region is causing "a credibility crisis for institutionality and (President) Piñera," environmentalist Sara Larraín told Tierramérica. Fisherfolk and indigenous people in southern Chile have petitioned the Inter-American Commission on Human Rights in their 15-year conflict with Celulosa Arauco y Constitución (CELCO), a paper pulp company which plans to dump toxic waste in the ocean, and with the Chilean state for alleged human rights violations. As tensions mount in Chile's Mapuche territories, the indigenous people have created a new legal defence body for cases involving resistance against the state, as they put little stock in the justice system for working out cases such as land disputes. Criminal law should not be used against freedom of expression, nor to silence community radio stations in Chile, say activists and journalists in response to closures of community radio outlets in this South American country. Trade unions and non-governmental organisations in Chile are worried that rightwing billionaire Sebastián Piñera's election as president will mean setbacks in terms of social policy and respect for labour and social rights. The Chilean parliament has approved the creation of a national institute for human rights, another step towards fulfilling the human rights agenda of the government of socialist President Michelle Bachelet. Although agricultural exports are among the most productive and steadily growing sectors in Chile, rural women continue to face precarious jobs, low wages, little access to land and the growing dominance of agribusiness. "They burst in aiming machine guns at us. They found him in the hallway, they grabbed him by the hair, they threw him on the floor and they beat him up," Ida Huenulef told IPS, describing the arrest of her son Miguel, the first indigenous Mapuche activist to be charged under the Anti-Terrorist Law by the government of Chilean President Michelle Bachelet.